Artwork details: pencil, 10 x 8 inches (25 x 20 cm), 2005. This is a little sketch that more or less came out of nowhere - a grouping of Devils, complete with Hell Cats. I called it "?Conspiracy" simply because that's what it looked like - I've no idea what the conspiracy is about, but you can bet the cats do! 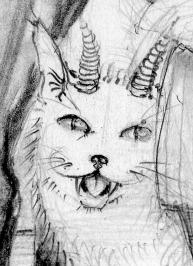 She Devils and Hell Cats - drawing by Nancy Farmer.